We provide confidential, affordable, and fast checks for sexually transmitted diseases to patients residing in the Lafayette area. We understand that it shouldn't cost a fortune to regain your peace of mind. Getting screened in Lafayette, IN has never been easier. We have removed the need for embarrassing doctor visits, long wait times, and crowded waiting rooms, and improved it with our simple three step process. First, place your order with us over the phone or online. Next, visit the STD testing Lafayette center closest to you any time during operating. Lastly, access your results online from home. Getting checked is that simple. Getting checked with us is easy, fast, and convenient. We offer numerous STD testing Lafayette locations in IN and the Lafayette area, ensuring that there is a location nearby. Simply select the laboratory closest to you and get your screening do neat your convenience. Your STD testing Lafayette lab visit will only take 15 minutes and does not involve any swabs or exams. Additionally, our services have among the lowest std lab test prices, ensuring that you'll get the screening and care that you need at a reasonable price. We have laboratory, which are considered some of the top diagnostic centers in the country today. Their knowledgeable and experience staff will provide you with excellent patient care. The STD testing Lafayette lab visit will only take 15 minutes and you don't need an appointment. 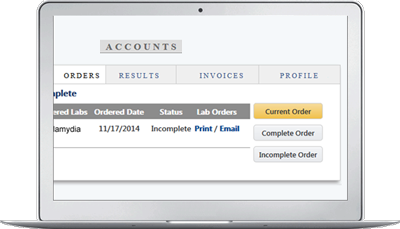 You can show up with your lab order whenever you are available. Our STD testing Lafayette laboratories offer a number of testing services, so no other patients will know why you are there. We strictly adhere to state and federal laws regarding patient confidentiality, including HIPAA. We will never release your information without your consent and take many steps to ensure it is protected throughout your process.